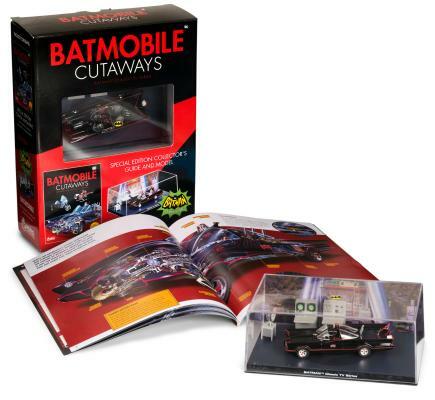 One of a kind custom cutaway book of every vehicle from the original TV series, packaged with a die-cast model of the iconic 1966 Batmobile! Includes a 1/43 scale die-cast metal replica of the classic 1966 Batmobile in a diorama display of the Batcave - the Caped Crusader's subterranean crime lab! Learn the secrets of all the vehicles from the classic Batman TV series! This 72 page guidebook features original cutaway artwork approved by Warner Bros. and DC Entertainment. Lavish illustrations and photos highlight every vehicle from the TV series - the Batmobile, Bat-cycle, Bat-copter, Bat-boat, and more. Cutaway artwork reveals the hidden details and gadgets of the Batmobile such as the Mobile Crime Computer, Bat-Ram, Batphone, afterburner, Detect-A-Scope, rocket launchers and "bat turn" parachutes. More features include detailed blueprints and schematics from the original design and fabrication which was overseen by master custom car fabricator George Barris. Includes dozens of photos and illustrations from DC Entertainment's vast archive of over 75 years of Batman comics, film and television adventures. Richard Jackson is a specialist in the commercial/licenced adaptation of Movie, TV and Comic characters. He has worked at Eaglemoss Ltd since 2004, developing and editing magazine and continuity series, and overseeing the creation of die-cast vehicles and figurines. His magazine work includes the Classic Marvel Figurine Collection, the Marvel Chess Collection, the DC Chess Collection, Marvel Fact Files and Marvel Movie Figurines, plus the Diamond Award-winning Batman Automobilia. His figurine and die-cast work involves working with sculptors and licensors to commission digital sculpts using a wide range of digital packages. Richard is also a world expert on Batmobiles, having researched and produced more than 80 different models from the years 1940 to 2015. This first of three volumes by Richard Jackson features the revolutionary machines from the BATMAN Classic TV Series in incredible cutaway detail. See under the hood, behind the controls and inside the gadgets of BATMAN’s fleet of crimefighting vehicles, plus the cars of his greatest foes. Peel back the layers to reveal each vehicle’s weapons systems and construction secrets. Featuring the Batcycle, Batcopter, Batboat, Jokermobile, Kitty Car, and much more, this lavishly-illustrated series comprises the most comprehensive visual collection of Batmobiles ever produced.